Last night Theresa May’s Tory (aka UKIP2) government suffered a major defeat in the House of Lords. By a large majority, the Lords agreed to an amendment to the EU Withdrawal Bill to give MPs the power to stop the UK from leaving without a deal, or to make Theresa May return to negotiations if the deal is considered not good enough. Supporters of the amendment said that Parliament, and not ministers, must “determine the future of the country”. Government ministers have expressed anger at the Lords amendment, calling it a betrayal of ‘the people’s will’. Mrs May is now trying to persuade MPs to strike out the change. But wasn’t one of the main points of the Brexit campaign to give our Parliament in Westminster ‘more sovereignty’? Isn’t it the job of our Parliament to consider, in great detail, all decisions affecting the future of our country, and to hold the executive to account? When making a decision, our Parliament has many debates, and multiple votes, over a period of time, often many months, and our Parliamentarians can reconsider, amend or reverse the decision at any stage of the process. 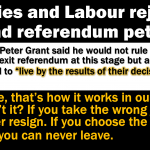 But in the referendum us, ‘the people’, only had one vote, on one day, on a simplistic binary choice, without any chance to reconsider, amend or reverse our decision, even though voting took place almost two years ago. What sort of democratic process is that? Many people directly affected by the outcome of the referendum were denied a vote. The referendum was, by Act of Parliament, advisory only and not binding, but a minority was allowed to ‘win’. (Yes, a minority: 17 million people voting for Leave is not a majority in a country with 46.5 million registered voters). The margin between Leave and Remain was wafer thin – less than 4%, so well within the margin of error. Two of the four countries of our Union of the United Kingdom did not want Brexit, thus literally splitting the UK in half. There was no manifesto, blueprint or plan presented for Brexit (and there still isn’t). So, the 17 million who voted for Brexit didn’t all vote for the same Brexit. No one could have given ‘informed consent’ for Brexit, because none of us were fully informed about the meaning of Brexit. Some Leave voters thought we’d be staying in the Single Market after Brexit. (Yes, that’s what some Leave campaigners told us). Some thought we’d be staying in the EU Customs Union, or at least ‘a’ customs union after Brexit. (Yes, that’s what some Leave campaigners told us). Many voted for Brexit because they believed the lies of the Leave campaign (more money for the NHS; getting our country back; more sovereignty; control of borders; the EU is undemocratic; Turkey is joining soon.. all misleading and false). Some voted for Brexit because they never imagined ‘Remain’ would lose, and so used the ballot box as a protest vote against Cameron’s Tory government. There were many reasons people voted for Leave, but no single reason, and certainly no defined agreement on what Brexit would mean or entail. (We still don’t know). 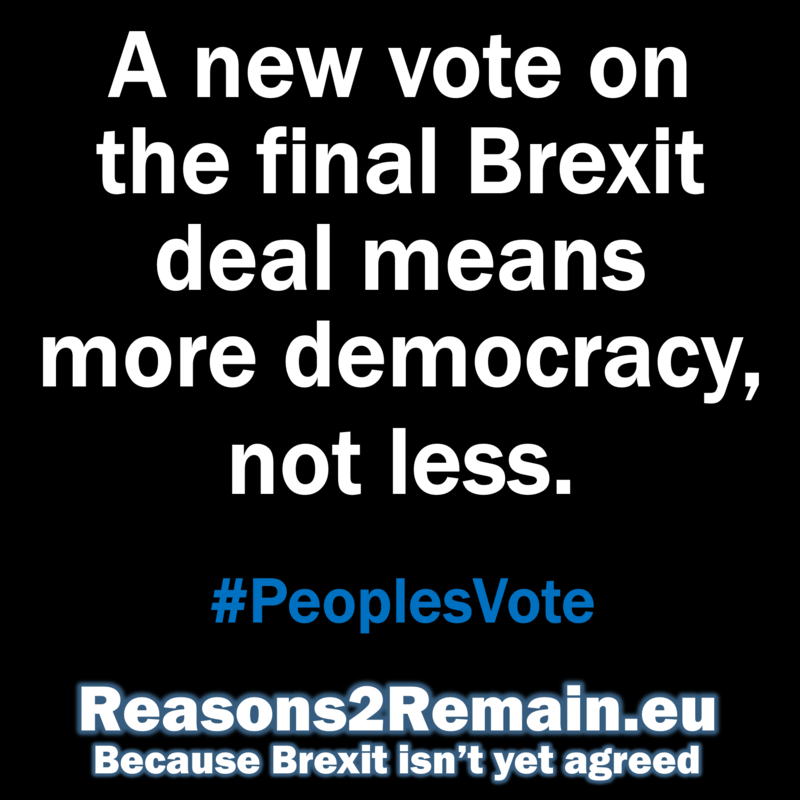 And in any event, even if Brexit was ‘the will of the people’ on one day in June 2016, that’s almost two years ago, and multiple polls have since shown that the will of the people is not now in favour of Brexit. But this is the problem of referendums. They are not democratic, and they are a lousy way to make a decision. 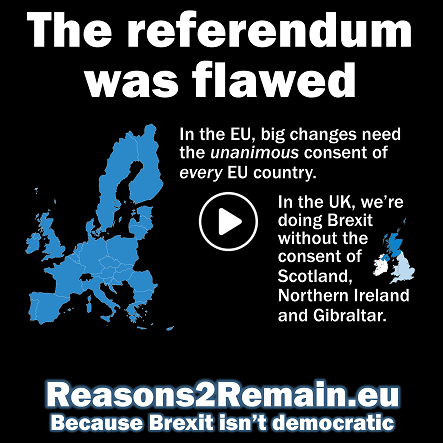 So far, this has not been a problem in the few referendums we’ve had in the UK, because referendum results have not produced controversial results. 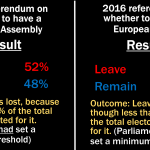 But, for the first time in a UK referendum, voters on 23 June 2016 rejected the status quo, the advice of the government, and the consensus of Parliament. The Brexit vote pitched ‘direct democracy’ against ‘Parliamentary democracy’, with potentially disastrous consequences. And therein lies the problem now facing and fissuring the United Kingdom. Direct democracy (referendums) and representative Parliamentary democracy can be dangerously incompatible. They cannot co-exist without the potential of one damaging or even destroying the other. The few referendums that Britain has held in recent decades haven’t caused such major problems because, until now, referendums were generally relied upon to return a result in accordance with the status quo and/or the will of Parliament. Put simply, voters tended to dislike change. But that ‘rule of thumb’ was dramatically and perilously turned around when Leave won. For the first time, ‘the people’ voted against the overwhelming will of Parliament. So which ‘will’ has superior sovereignty: Parliament, or ‘the people’? The conflict has the potential to destroy the very core of our democracy. This is a problem that has never happened before in Britain, but it should have been anticipated. After all, referendums are a relatively new phenomenon in our country, and many sage British politicians were, for good reasons, completely against them. Conservative Prime Minister Margaret Thatcher was also adamantly opposed to referendums. She said that they were the “device of dictators and demagogues”. And it’s true: Hitler, Mussolini and Napoleon III all used referendums to legitimise decisions they had made. They could go to the populace and ask them any question, and then interpret the simplistic one-word answer almost any way they wanted. Of course, former Prime Minster David Cameron knew the dangers of referendums all along. But he never anticipated losing. After all, he felt confident after previously ‘winning’ two major referendums in a row: a referendum to change the voting system (2011; answer no) and a referendum giving independence to Scotland (2014, answer no). Since Mr Cameron was so convinced that there was almost no chance of losing the EU referendum, a potential clash between the ‘will of the people’ and the ‘will of Parliament’ was not going to occur. What’s worse is that there was no need for a referendum at all. Mr Cameron only decided to hold one to resolve an internal dispute in the Tory party, rather than for the national interest. Euroscepticism, and the call for another EU referendum after the one in 1975, had always been on the minority fringes of the main political parties, especially as around two-thirds of both houses of our Parliament strongly supported EU membership. Mr Cameron not only gambled with our country’s future by holding an unnecessary referendum, but he also put at grave risk the foundations and established mechanisms of our traditional method of democracy. Following the referendum result, MPs and members of the House of Lords felt stymied. The vast majority of their heads and hearts told them that Britain’s best interests are served by remaining in the EU, and that Brexit is likely to cause the country severe economic hardship and isolation. After all, that’s what the vast majority of them told us during the referendum campaign. 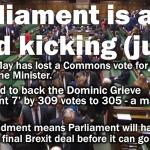 Instead of the referendum giving our Parliament more sovereignty – one of the many disingenuous promises of the Leave campaign – the referendum result severely weakened and demeaned Parliamentary sovereignty and the function of MPs. Even though it was decided by Parliament that the referendum should be advisory only and not legally binding, politicians have felt agonisingly compelled to obey the Brexit result. Were it not for the referendum, by a huge majority, Parliamentarians would have strongly and unequivocally voted against Britain leaving the EU. Instead of empowering Parliamentarians, the referendum result has turned them into puppets of ‘the will of the people’. Unlike decisions of Parliament, which can be fully considered, amended, changed and reversed, the simplistic one-word answer of the referendum now appears to be cast in stone. This is all a hopeless mess. The so-called ‘will of the people’ has trumped and thwarted Parliament’s sovereignty, even though that ‘will’ was based on a minority of registered voters, who voted for something that was not clearly defined or understood. (Indeed, the promises and claims made about Brexit were based on shocking lies). 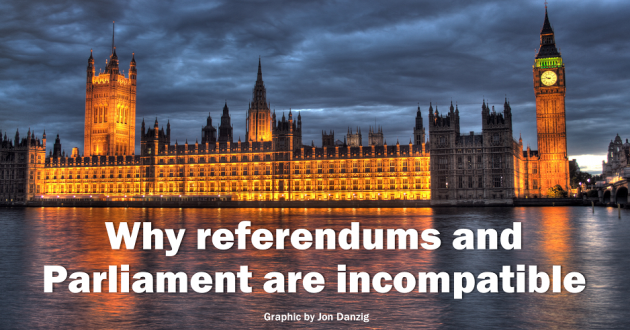 The simple fact is that referenda are only benign when they agree with the will of Parliament. But when a referendum returns a result that’s entirely the opposite to the will of Parliament, our democracy, and our country, are in danger of tearing themselves apart. Prime Minister Theresa May must have realised this. She considered it necessary to resolve the very narrow margin for Leave in the referendum by calling a snap general election last year, with the goal of winning a huge majority to give her an unquestionable mandate to go ahead with Brexit. But instead, the country rejected her plans, leaving her with no majority at all. That should be the cue for Parliament to regain its confidence and to take back sovereignty that it imagined, falsely, had been removed from it by the advisory referendum of 2016. We now need a return to fully fledged, representative Parliamentary democracy, that has served this country well for hundreds of years. We now need Parliament to act in the best interests of the entire United Kingdom; not just the 17 million who voted for Leave, but for all the people of our country: the 65 million who live here, and who our Parliamentarians are supposed to represent, and protect. This entry was posted in Current Affairs, Democracy & Citizenship, Politics & Public Policy, The EU and tagged Article 50, brexit, David Cameron, EU referendum, EU Withdrawal Bill, House of Lords, Parliament, referenda, referendum, Theresa May. Bookmark the permalink.